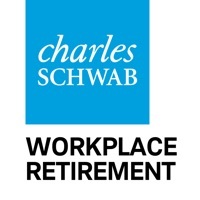 Note there are multiple Schwab apps. You will need to determine which one is applicable to your account and download that app. to access your account. I would like options like index funds with better performance and lower fees. I reject limited choices that make more money for the institution then the investor. I love this app! Very intuitive and easy to use. Crisp, easy navigation , very clear and to the point....Thanks! I know this is not the same as looking up your data on your desktop on their website but still this app could be more helpful. I’m not going to complain about various minute things but one thing stands out - when they state your balances it should say right there as of what date and what time. You don’t know if you’re looking at your previous day balances or the current day after the bell. Fingerprint I’d does not work and there isn’t much information to access on the ap. Great app on phone and tablet. Gives me the info I need to invest and watch my investments. A user requires ANOTHER password (as if we don’t have enough already)! Several of the links are permanently “temporarily unavailable.” NYC rush hour traffic slow. Just use the mobile site. It would be great if I could see a breakdown of which funds gains and losses occurred in. I may need to adjust my portfolio. Tried logging in with Touch ID today like in the past and this app is now requiring a new 6-digit pin. Very frustrating. If Apple still allows me a 4-digit pin, I think this app should too; otherwise it’s just another thing to have to remember. I like the fact that the app gives you the ability to see your percent invested and the breakdown of how your money is being invested. The only thing I don’t like is that if you want to change your plan, you can’t simply click on your contribution, where you change your percentage and then click on the section that would allow you to change the plan. 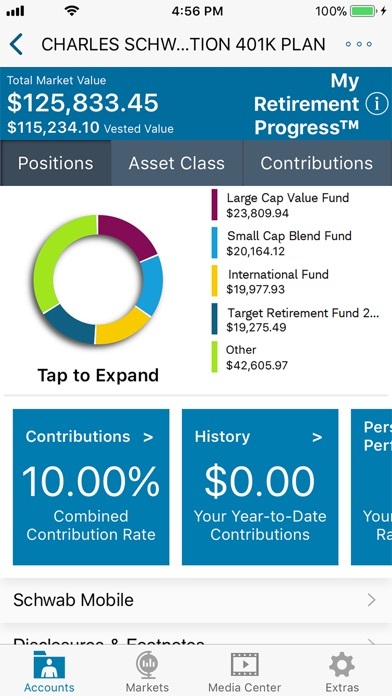 You have to click on the top right drop down menu, then click on history and then you can adjust which plan you are invested in percentage wise. It’s a pain in the neck. 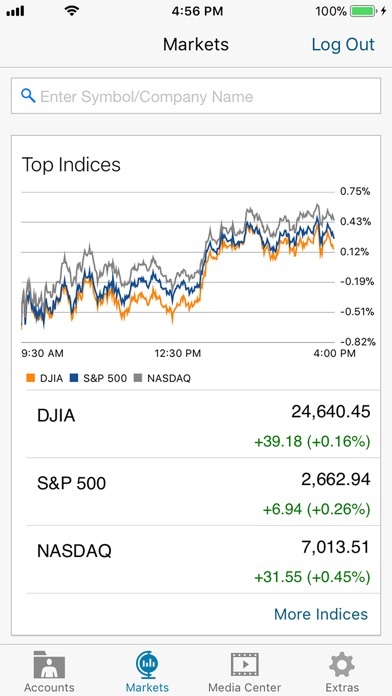 The app makes it so easy to check my progress and see how world events affect the market and my financial goals. Thanks! A few years ago, the app used to give me accurate information on my personal performance. Ever since their major “update” about 3-4 years ago whenever that was, it tells me my start value and ending values are both way higher than they are, so any performance percentage increase or decrease is totally off from reality. Fix the darned bug already! Useful for obtain account information and making deposits. Cumbersome to use for research. User interface is not very intuitive. Could organize with lists of accounts and then lists of assets within those accounts. Those can then be tabulated with performance both daily and since inception (or some other modifiable time range). 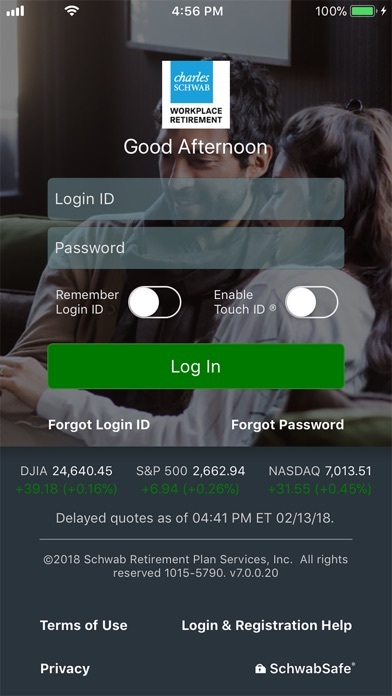 See Fidelity’s app. I wanted this app in order to check my balance and update contributions without having to log on through my work laptop and internal network. This app checks those boxes and also has a great rate of return feature. The app will not let me enroll my plan. There’s no way to view your current assets or positions , gains or losses ... etc. It is useless. Called the IT number they weren’t able to fix it put in a “ticket” to the app team. No one has ever contacted me. For example it shows ytd 401k contributions but doesn’t show Employers DC contributions. Thus I have no idea where I am in regards to my 415c limits. I find I have to log onto the full site. Thus it would be nice to have a single click to full site. Easy access to your retirement plan while on the move. Simple, easy to use. I need to be able to filter by multiple investment categories at the same time, not just one category at a time. Also, there is no indication or explanation of subpar mutual fund performance. I suppose it is time to consider moving my investments to another brokerage firm with better transparency and accountability. The my retirement progress on the website never works. I put my salary in and it doesn’t calculate just keeps calculating. Wish it told me how well my investments were doing. 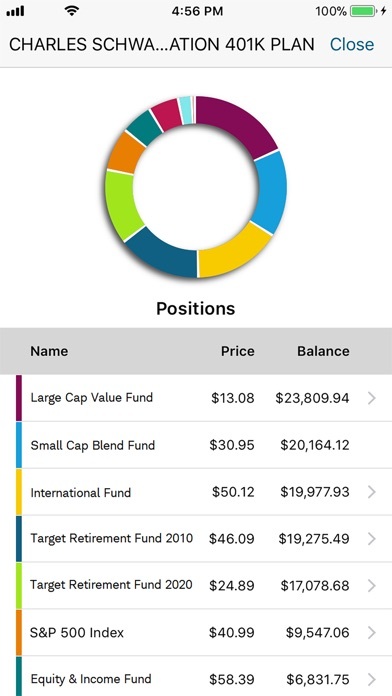 This is a great app to quickly see my retirement account, and the My Retirement Progress is a terrific feature. What I’d like to see enhanced is a way to include my spouse’s SSN benefit separate from my own, but have her benefit included in the overall picture of what our retirement picture might look like. Very very slow website. Very very slow sells and buys. Very cumbersome and difficult to find or do anything. All buys, sells, and reinvested fund calculations are incorrect. No matter what calculator you use. They will NOT answer questions in regard to erroneous calculations. AND DO NOT use Quicken for investment decisions since Schwab sends incorrect, and missing information showing incorrect average price. Even online, their calculations are incorrect. Do simple multiplication or division on info Schwab shows and you too will be confused with NO EXPLANATIONS! These folks are sucking pennies from everyone and no explanation. And no, they do NOT show any fees....just magical extraterrestrial math! Terrible as a fiduciary and even worse as a administrator of your hard earned money. And they will NOT answer your inquiry...they send canned answers that don’t pertain. Won’t look at screenshots and will tell you they can’t even though they allow you to send them and encourage it! They simply do NOT care about you...ONLY their coffers. Can’t wait til I turn 59 1/2!!!! TD much better. Schwab appears to be crooks hiding behind obscurity and secrecy. NOT transparent at all!!!! Why can’t I see how many shares I own inside the app. So stupid. 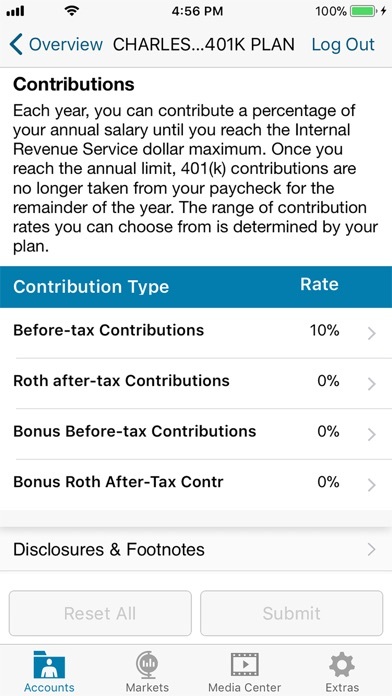 Have trouble every month trying to get in and see my 401k, especially when trying to jump between apps to see my Roth IRA. They don’t seem to speak to each other all the time. Bells and whistles but just doesn’t do what regular site does. Weak! Most of the capabilities available by logging in on a computer are here at one’s fingertips using the phone app. This app facilitates monitoring and managing financial assets and eliminates the need for a computer in many cases. I do find this app so hard to navigate. The layout is super complicated.